The Greek island of Lesbos has long been a popular choice for people wishing to escape the continent to holiday in its picturesque scenery while tanning on one of its many sandy beaches. However, as of recent years, Lesbos has had an influx of a very different type of traveller. The vast numbers of refugees clambering onto the EU’s doorstep spurred the founding of the Emergency Response Centre International (ERCI), an NGO that provides humanitarian aid and emergency response in times of crisis. While I had been aware of the migrant crisis, it wasn’t until I spent a few weeks last summer working under two of ERCI’s specialist areas (refugee camp coordination and search and rescue support) did I realise the scope of suffering and desperation just off Europe’s coastline. I met with my friend Samuel Hayden, a Trinity alumnus, in Athens, and we caught a cheap flight to Lesbos. There, we joined George Kakas, a mate from my Erasmus year in St Andrews, who had already started working a few days earlier. On arrival, we were brought to “Middle House”, where we met some of the volunteers and received our IDs and gear. ERCI is an amalgamation of volunteers of different nationalities, mainly from Europe, the US, and the Middle East. It was fascinating to see a group of people from the far reaches of the world unite with the same agenda: to lighten the load, ever so slightly, and help those fleeing for their lives. As the camp was particularly short-staffed, I was immediately put to work in Kara Tepe, one of the two refugee camps the ERCI help coordinate on Lesbos. I was greeted by a swarm of loud, happy children, giving me high-fives and shouting in broken English, and was surprised at the positive and upbeat energy in the camp. Afterwards, I learned that the bright ERCI hoodie had become a symbol – these children whom I’d never met, who had suffered difficulties I couldn’t imagine, instantaneously looked up to me as a guardian and a friend, someone they could trust. Some of the kids had been living in the camp for two years, and though volunteers came and went, the ERCI always had a presence there and had earned their respect and trust. Kara Tepe was a relatively small camp (less than a thousand inhabitants) that looked after vulnerable asylum-seekers and was mainly comprised of families with children, elderly people, and unaccompanied minors. The other camp, Moria, was much larger, acted as a registration centre run by the Greek army, and accommodated men travelling by themselves. Sam and I were based in Kara Tepe, whereas George was based in Moria, as he could speak Greek and was able to translate the broken English of the asylum-seekers for the army. From what I had heard, Moria was far more tense than Kara Tepe, which became clear when reports of rioting there became commonplace. On my first night, I was to shadow a Dutch volunteer who was leaving the next day. The people doing the rosters hadn’t dealt with an Irish volunteer before and had assumed that the Greek heat during the day would be too intense for red hair and freckles. Though I didn’t exactly fit the stereotype, I felt that starting off on the night-shift was a good idea. Though not quite a baptism of fire, my first shift was anything but boring. Tensions had been high from an attempted break-in the night before, where two men had been stopped from cutting and climbing the fence. As they had not been apprehended, the camp was on high alert. When night fell you could feel the children were anxious, as there had been rumours of a threat of child-traffickers. The night-shift involved nine-hours of constant walking, checking the perimeter fence, keeping in continuous contact with camp security. That night, there had also been an attempted suicide, where a desperate young mother was found unconscious by her infant child. The ERCI medics were on hand immediately and brought the young woman to hospital, where she recovered. Although my first few hours were intense, they were not on the same scale as George’s first shift, as he had to dive deep into the Mediterranean Sea to retrieve the body of a poor soul who had drowned after falling out of a boat. After a few days, I felt confident enough to chat to some of the children. One child, named Mabas, had been in the camp for over a year and a half and, in that time, had learned the basics of three additional languages. He was from Syria and was able to comfortably hold a conversation with me in English. He told me it took three attempts to get to Lesbos: the first two times their boat didn’t make it to Greek waters, and so they were caught and brought back to Turkey. He told me that, as punishment, they had been made to throw their mobile phones and luggage into the sea, leaving them with nothing but the clothes on their backs. He wanted to be a doctor and said that his father knew a person in Germany that would help them and that they had been waiting for eighteen months to get processed. I was shocked to find out he was fourteen years old; he didn’t look over the age of ten or eleven: a combination of malnutrition and severe stress, I was told. Perhaps another reason why the ERCI is so well-respected in the camp is that many of the camp’s inhabitants were rescued from dinghies in distress by ERCI’s search and rescue operation. The search and rescue is based on Katia, which is a rocky part of the coastline and a very significant part of the island, as it is the last eyes on the south-east. Illegal migrant boats will often try to land there, but if they miss it, it can be fatal. Once more, we were placed on 9 or 10 hour shifts with thermal heat vision goggles, constantly staring out to sea, scanning the horizon for any unusual activity while in radio contact with NATO or other NGOs. At 4am one morning, the houses were awoken by Sam shouting that there was a boat landing and they needed help. The boat was roughly the size of two double beds, a small fishing boat designed to carry about four people. However, thirty-seven people (including thirteen children) were squashed inside. I had never seen people in such a vulnerable state, carrying their babies in their arms after risking their lives to a smuggler. Many were sick or injured, others panicked as they didn’t know who we were or what we might do to them. 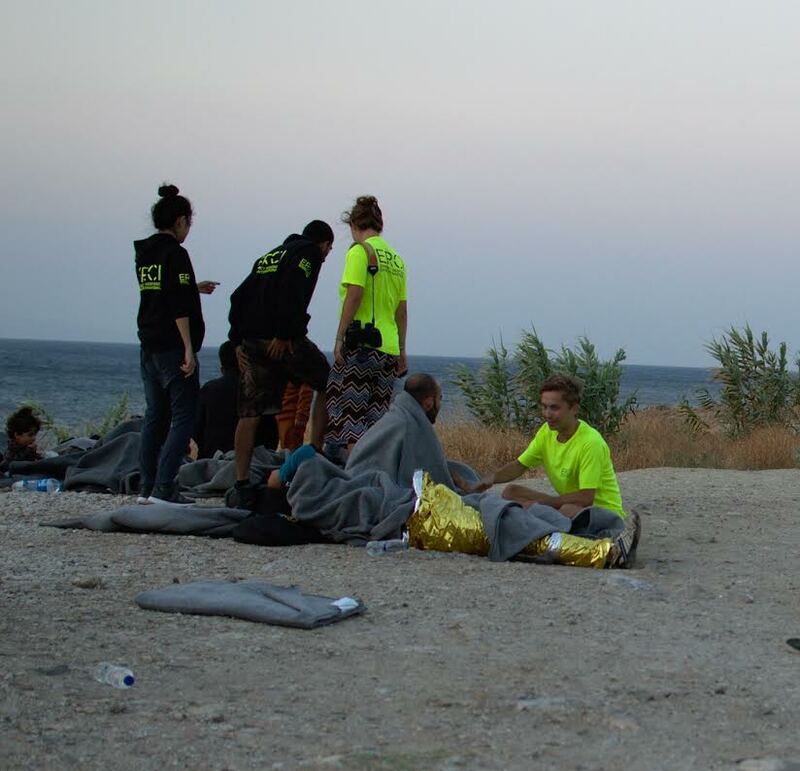 I was told by a volunteer from New Zealand to just keep repeating: “You’re in the EU and you are safe; you’re in the EU and you are safe.” On the beach, we gave them humanitarian aid and had the medics examine each person, especially the babies. It was only then that the energy changed as the anxiety subsided. The children began smiling and laughing – you could tell that they had heard the letters “EU” a million times before and were told that, if they reached it, all would be OK. They had to leave their homes, friends, and family members to risk their lives at an attempt to get to this magical place where they could stop being afraid, and they knew now they had made it. I had mixed emotions and felt a note of betrayal knowing that there was a bus en route to bring them to Moria, where they might spend many years of their lives behind security wire in a refugee camp. I sat down with one of the men who was in the boat. He told me that they had been floating in darkness and silence for four hours. People were lying on top of people so to fit as many in as possible. He also said that on his side the boat started leaking and water constantly flowed-in, and he was resigned to the fact that he might drown. He told me he was forced to leave Syria as all the houses in his town were “broken” because of ISIS. His family members had been killed, and he thought coming here was the only way to start a new life. There was a man next to him who asked where we were; I told him we were on Lesbos. He was confused because he heard two of the volunteers speak Portuguese. I told him we had people from everywhere, and that we were all volunteers here to help out. They asked me where I was from, and I told them Ireland. They said they had heard a lot about Ireland, they liked Irish people, and some day they would like to visit. At this point, the Moria bus pulled-up, and they were herded in by the Greek army. Ireland prides itself as being a country at the centre of Europe. However, we are very disconnected from the refugee crisis. We are lucky to have one of the highest qualities of life in the world, but we cannot forget that for centuries we were those migrants. We are famous for our sprawling diaspora, why you can find an Irish pub in nearly every city you visit. We were those people, forced to leave our homes for the possibility of a better life, arriving on a foreign shore, and having to start from scratch. My uncle, having worked for the UN, told me the Irish were always a preferred nationality to send on peace-missions, as we had a hybrid identity: a Western country, but one with post-colonial heritage. He said that when he was working in Asia, a warlord finally agreed to make terms with the UN on the condition that he could hash them out with an Irish soldier and not an American or someone from an “imperialist” European country. While Ireland is now very much rich and Western, we must not forget that these people, risking their lives for a chance of a better future for their children, were the Irish not too long ago. I was told, while working over there: “No one puts their children in a boat unless the water is safer than the land,” which should compel Ireland and Europe to accommodate those desperately begging for help at our door.